Next month is the release of Francis Knight’s thrilling debut fantasy FADE TO BLACK (US | UK | ANZ). 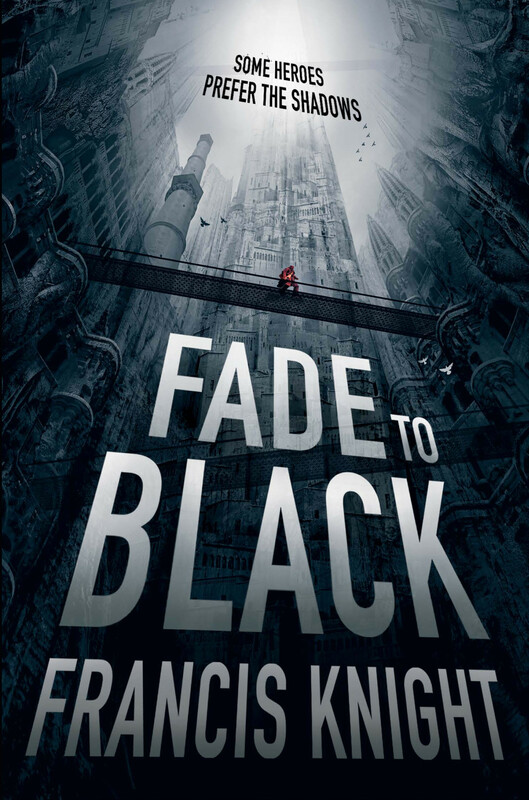 Like the city of Mahala, a city built upwards, not across – where streets are built upon streets, buildings upon buildings, FADE TO BLACK will surely rise as a favorite among fantasy readers this year. Check out some of the great praise this book has already received including a review by Felicia Day. The first chapter can be read here while My Bookish Ways and Bookworm Blues will have the next exciting chapters for you all later this week. So get ready for the Rojan Dizon series, and watch your step! Darkness and corruption are everywhere in Mahala, and if you are not careful, you’ll find yourself falling into the depths of the Pit. I forced the door, nice and quiet, with my ever-so-slightly-illegal pulse pistol at the ready. Magic wasn’t usually on the agenda for runaways, but this little madam was exceptional: booby traps a speciality – I’d almost gone up in flames this morning. Twice. If it wasn’t for the obscene amount of money her parents had offered me to find her, I’d have given it up as a bad job. The room beyond the door was even more dingy and rubbish-strewn than the corridor, and that was saying something. Rainwater had driven through a broken window and the faint stench of synth drifted up from where it pooled. I sidestepped around it. You could catch a fatal dose and never know until it was too late. Residents hurried away behind me with a mutter of footfalls. One sight of me, a burly man in a subtly armoured, close-fitting all over with a flapping black coat, and the scavenge-rat teens that called this place home took to their heels. I dare say it looked too much like a Ministry Special’s uniform with an added coat. Living this far down, a nose for trouble was essential. I checked around carefully, trying to listen past the far rumble and thump of factories above us. A flash of movement off to my left, a hint of bright blue shirt. Lise, the girl I was after. With nothing to alarm me – yet – I made my careful way in. There it was again: a flicker of blue, floating in the gloom. I slid my fingers round the pistol’s trigger and pointed it.